Brown is the colour of naturalness. It stands for the beauty of nature in all its facets. There is a huge variety of different shades of brown existing in nature. Be it different kinds of woods or tunnels made of sandstone. You will be surprised about the different number of brown tones that tunnels and plugs can be made of. Also very popular are our brown antique styled steel tunnels. They look a bit like rusty, old jewelry with patina. This kind of jewelry is very stylish and will perfectly fit to any autumn -, winter -, spring - and summer - outfit. The variety of brown tunnels is based on the different kinds of wood that the tunnels are made from. The most popular ones are: Granadillo wood - this is wood of the tree from which you probably also like to eat the fruit: pomegranate. This tree´s wood is very beautiful and therefore perfectly suitable to produce wooden flesh tunnels and other jewelry out of it. Also very popular are light brown tunnels made of canary wood and red brown amaranth tunnels. There is an enormous amount of different kinds of wood and there is also a natural variety of the wood tone and the grain so that every piece of brown jewelry is unique. Silicone tunnels have the advantage that they are very flexible, lightweight and perfectly suitable if you are sporty. Brown also is a very stylish colour for silicone tunnels. It is symbolizing seriousity and beeing down - to - earth. The colour is signifying stability, structure and support as well. Brown silicone plugs are also used as hider plugs. 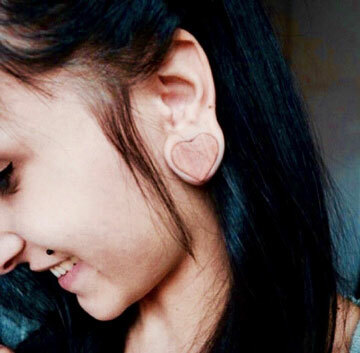 These are plugs you can use to hide your ear lobe piercing. If you are planning to go to a job interview or any other formal event where you don´t want to wear flesh tunnels the skin coloured brown hider plugs make your tunnels more discreet. Even more impressive than the wooden flesh tunnels are the brown wooden plugs. We offer them in dozens of different kinds of wood in various shades of brown. Every plug is unique because of the natural grain and colour variations. In our shop you can also find brown plugs gemmed with crystals. These ones combine the naturalness of wood with the glamor of diamonds. Although they are of course no real diamonds they almost look like real ones and of course they cost a lot less. If you prefer brown tunnels with or without gemstones lies only in your hand but you can be sure to find your favourite brown piercing jewelry here.